Talk therapy for many newbies to therapy can be daunting. The act of speaking alone with a therapist about your feelings, emotions and troubles can inject fear into those new to the process. 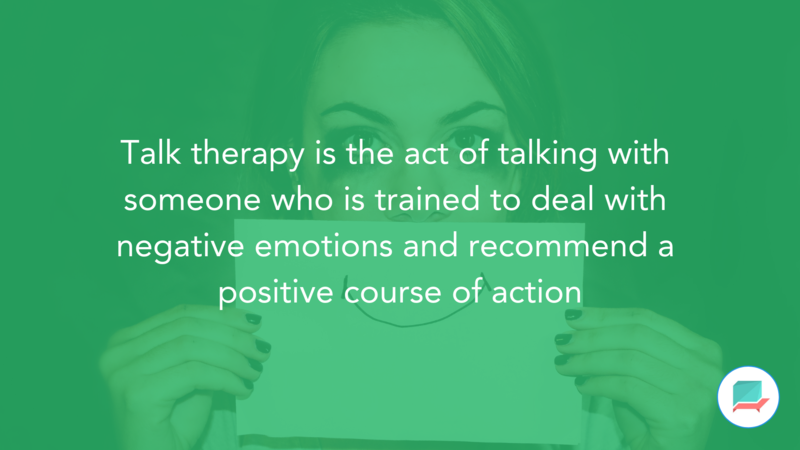 But talk therapy doesn’t come in one plain format. There are various types of talk therapies that can be used case by case to address the type of mental health concerns at hand. A mental health professional or doctor will most likely be the best person to recommend you the next course of action and which type of therapy to approach as you begin your treatment. Talk therapy comes in different formats. The most traditional method is one to one speaking. Typically, a therapist will conduct this asking the client to provide details to prompts. This is just one of the many forms of talk therapy, with others involving groups, over the phone conversations, with family members or with your partner as a couple. None of these therapies fit everyone’s needs. 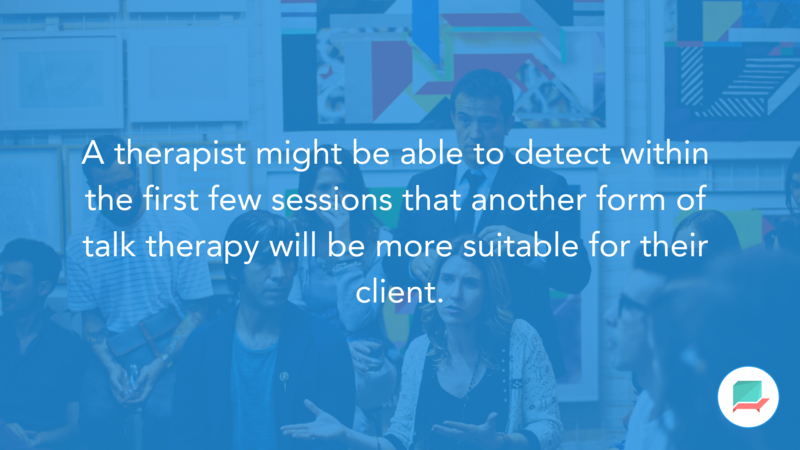 A therapist might be able to detect within the first few sessions that another form of talk therapy will be more suitable for their client. Or that the therapy, from feedback, doesn’t suit the needs of the client. Let’s begin to explore the various types of talk therapies that could become recommended to you and what you should begin to prepare yourself for as you start treatment. 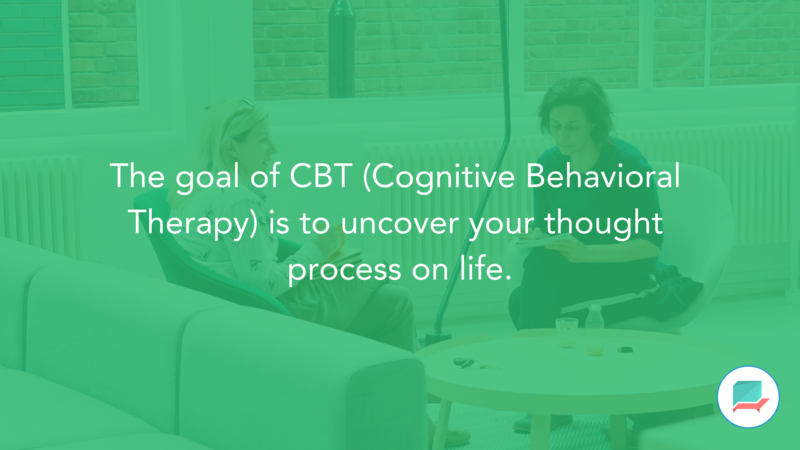 The goal of CBT (Cognitive Behavioral Therapy) is to uncover your thought process on life. This process has been designed to help decrease unhelpful patterns of behaviour. CBT is commonly a treatment provided by a therapy that conducts roughly 12 to 20 sessions. CBT addresses a range of mental health issues including; depressions, anxiety, panic attacks, phobia, OCD (Obsessive Compulsive Disorder) and PTSD as well as some other eating disorders. The course of treatment is designed to produce favourable results with your habits, routine and thought process around negative emotions. During this form of talk therapy, your therapist will create a set of goals that you will work towards across the sessions. They’ll also keep a track of your progress week on week, occasionally setting homework to help activate learnings from sessions. Interpersonal therapy is a form of talking therapy that focuses on depression. The therapy helps to outline issues in relationships of the client with family, friends and partners. You might not be recommended IPT upfront, but go through CBT therapy sessions to uncover how you feel about your relationships and depression. The goal is to address the cycle of feeling depressed from bad relationships and becoming depressed affecting future or current relationships with those around you. These sessions normally are offered between 16 – 20 sessions due to the nature of the specific type of talk therapy. This is something to consider if you suffer from a depressive disorder. Please seek recommendation from a licensed therapist or counselor. Counselling has been a popular form of talk therapy for many years helping to address the many difficulties in life surrounding you. During these sessions, you’ll address issues you face and over roughly 6 – 12 sessions speak to your counselor in confidence about how to deal with these issues on a daily basis. Traditionally those who suffer from the following tend to get recommended counselling as a form of talk therapy. They include; struggling to cope with a long-term condition, chronic pain, addictions, fertility problems and other such conditions. CBT and other such conditions involving a therapy are focused more towards mental health conditions. Please seek recommendation from your doctor about which to take. Talk therapies don’t always involve talking all the way through. MBCT or Mindfulness Based Cognitive Therapy is one that combines mindfulness practices with cognitive therapy to address your mental health conditions. Whilst mindfulness has been constantly recommended in the therapy space thanks to its benefits to the mind and body, this type of therapy has a fixed programme of exercises and sessions to address the condition. During these sessions, you’ll address cognitive issues focused mainly on treating depression or an addiction. These sessions will focus on developing techniques like meditation and breathing exercises weaved in with talk therapies to address you thoughts and emotions. MBCT is normally recommended as a course to address recurring issues with your mental health condition and not always as a standalone treatment. One of the many benefits to this form of talk therapy is that you can activate many of the learning at home to continue a healthy routine and practice. Specific to PTSD (Post Traumatic Stress Disorder), the goal of EMDR or Eye Movement Desensitization and Reprocessing addresses traumatic moments using a range of specific eye movements and prompts to help you reframe situations and memories. EMDR has been developed to help PTSD sufferers that may experience flashbacks, nightmares, intrusive thoughts and bad experiences that remind them of a certain event they cannot let go. The goal of EMDR is to reprocess your memories of the event. Sessions tend to be between 8 to 12 sessions and a support network is important to the success of this treatment thanks to the nature of the memories and intensity of the sessions. As always, we recommend seeking help your GP or doctor to address your issue and to get the correct form of treatment recommendation. As you see from above, there are so many forms of talk therapies and even more to add to this list, so it doesn’t stop there. The important thing to takeaway is to re-frame how you think about therapies. Many people think of therapy as a one set course or route that isn’t customisable to each person undergoing the treatment. But this isn’t the case, therapies can be personalised, adapted and shaped to meet your needs and tackle your mental health condition. If you’re new to the Therachat Blog, feel free to explore our other articles surrounding the topics of anxiety, depression, therapy and other mental health conversations. We’d love to have you as a regular reader. Depression is regarded as one of the leading causes of disability worldwide, according to (ADAA ,2018). 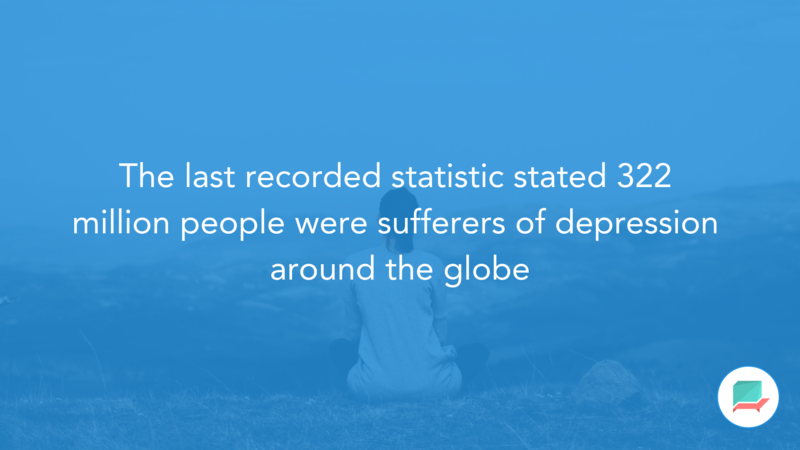 The last recorded statistic stated 322 million people were sufferers of depression around the globe. There are various types of depression, from major to the more specific cases of premenstrual dysphoric disorder. Many sufferers start with symptoms of anxiety and progress to depressive states. These mental health conditions can be dangerous if left untreated. Latest research has uncovered that close to 800,000 people have died due to suicide every year, a large proportion of these cases linked to depression. Cases of young people suffering from anxiety has risen in the last 10 years, with suicide being the second leading cause of death amongst 15-29 year olds. With depression on the rise. What other treatments can those feeling symptoms of depression explore? What is talk therapy? And how can it help conditions like depression? Talk therapy is the act of talking with someone who is trained to deal with negative emotions and recommend a positive course of action. Typically talk therapy is undertaken by a licensed therapist of councillor and is becoming a popular form of therapy in helping tackle mental health conditions. Talk therapy can come in many formats. The form of therapy is used with couples relationship, group counselling and even group therapy activities in which you can use in groups to express awareness around mental health conditions. Depression is the persistent feeling of sadness over a prolonged period of time for weeks or months, rather than a few days. Those with longer forms of health conditions like diabetes, heart disease and multiple sclerosis are more susceptible to depression. The symptoms of depression can come in many forms, some are listed in the link. Common symptoms associated with depression include loss of interest, lack of enjoyment in simple parts of life, feeling irritable and low energy, sleep issues, loss of appetite and not being able to cope or focus on everyday tasks. Psychiatrists – A medical doctor that treats mental illnesses. Typically prescribes medication, but also can provide talk therapy. Psychologists – A psychologist helps you to learn how manage depression and teach ways to cope with this. Counselors – A mental health professional that can help you manage and cope with your depression. It’s important to understand these types of roles before you commit. And a stated by Boston-based clinical psychologist, Eric Endlich, PhD “Your comfort level with a therapy is much more important that what kind of degree that person has”. Thanks to the nature of depression, using talk therapy to openly share emotions will help find the best way forward. Many of those suffering from depression have praised talk therapy as a constructive, accessible way to reduce symptoms and help address their concerns. There are a range of types of therapy that can be recommended to those suffering depression. They include CBT (cognitive behavioural therapy), interpersonal psychotherapy, brief dynamic interpersonal therapy, couple therapy for depression and counselling, all can be used for addressing depression. All of these types of talk therapy can be uncovered further in a 2016 Department of Health information sheet. Talk therapies are all included in these forms of therapy and can be used to help produce results. As you get started with therapy, here are ways to embrace talk therapy during sessions with a therapy and alternative ways to use talk therapy. Making the most of your time during talk therapy can be a healthy approach. During these sessions with therapists, you are paying and tend to have a limited amount of time to draw out all of your concerns. Before sessions, make your therapist aware of how you feel and how your previous week has been, so they are fully aware of your state of mind. This can really help the therapist navigate the best session for your current issues. Talk therapy could be an element of your session, but during this time your therapist will most likely prescribe or get you involved in active talk therapy with exercises, affirmations, and even homework. Talk therapy is very personal, so during the session, communicating with the therapist in an honest and upfront way will only help them to produce the best treatment package for you to go away with, to help improve your talk therapy, try introducing eye-contact as you speak with your therapists, speak to them about all aspects of your life that cause strain and don’t be afraid to share relationships. Depression is a condition that takes time to address and if you feel comfortable, share with your family and friends about what the therapist addressed and assigned to you for homework. This will make the sessions more accountable and provide a natural support network. Therapy doesn’t mean 1:1 intensive sessions. Therapy isn’t designed to be intensive. 1:1 in-person therapy have proven to be an effective way to start treatment. But with the rise of Skype and other such resources, online therapy has been a popular topic for many young people as a way to begin therapy. With plenty of resources offering 1:1 therapy, with smartphones and high-quality cameras and streaming bandwidth, this has become more accessible. Online therapists have become a proven way to get started with therapy and a much more approachable take on therapy. This is something to consider outside of traditional therapy. Homework is a productive way to address what is learnt in sessions, outside of sessions. A therapist assigning homework can help outside of sessions dramatically. This prescribed work has been tailored for you to be completed across everyday. Whether it is a worksheet or an active writing task, taking the bull by the horns is recommended here. With talk therapy, homework tends to orientate around speaking with others and actively addressing concerns or speaking through the specifics of your condition. Taking homework and making sure to complete it is so very important to the success of the treatment. Talk therapy can be used to help support depression alongside other such resources like meditation, self-help books, support groups, medication. Please seek guidance for medical treatment for all mental health symptoms. Let us know in the comments if you’ve found talk therapy to be beneficial in addressing depressive symptoms. Share with friends and family to help pass on useful resources. There are many different ways of managing anxiety that crops up across your day. From journals to meditation, there are endless recommendations and that can sometimes be very overwhelming if you’re dealing with anxiety. With countless solutions, what’s best for anxiety sufferers looking to take control of their own anxiety? First off, well done! You’ve made a positive step to seek out ways to manage your anxiety. In this guide, we’re going to dive into the topic of anxiety, why people suffer from anxiety and how it affects you on a day-to-day basis. The aim of this article is to help educate you about how anxiety occurs and why you feel as you do. Anxiety can take many different forms and doesn’t discriminate. Globally, according to research, 260 million people suffer from some form of anxiety disorder. In the US alone, 18.1% of the population live with an anxiety disorder, that’s over 42 million people living with anxiety. The studies mount up and the anxiety crisis around the world is continuing to grow because of a combination of 21st-century pressures. Treatment from therapy is one of the many ways to manage anxiety but it isn’t limited to the sessions you take part in with your therapist. Anxiety can be controlled and tackled outside of the sessions. There are many anxiety remedies that people use that help them cope with anxiety. They range from healthy food options to over-the-counter remedies and even positive habits. We’ve put together ten useful remedies that you can take away and use in your daily routine to tackle anxiety. Broken into these three core categories, all the anxiety remedies have come with some research or recommendation from therapists. It’s time to head back to school! With the introduction of September, students around the globe begin planning how they’ll approach the upcoming academic year. Internal discussions like what crowd to mingle with, which classes to pick, what to wear and more spring to mind. But not all students look forward to the new school year. For many students, being back at school can cause severe stress and anxiety. Triggers range from the stress of being around other students to the barrage of workload offered up by teachers. This stress and anxiety can go unnoticed inside the classroom but cause a huge amount of strain to a student’s mental health. This will help you to navigate stress in school with a host of recommendations to help you tackle it. Whether you are looking to apply this advice to your own efforts or bringing together tips for your friends, family or children, stress management is something not to be ignored and treated as early as possible. Feeling lazy?! Listen to this article here! During our time at school, we undergo many different types of stress. Deadlines, relationships, results are just some of the examples that cause us strain. Understanding the triggers for stress can help you to pinpoint the best route forward. There are countless stressors that cause students to dread school. From student to student, the reasons will vary. Here are some of the most common causes of stress in schools for students. Being New – Being brand-new to your classroom can be very scary. Being the new kid on the block can have its benefits and its negatives. But the stress causes from the negative attention drawn to you can damage your self-confidence, this can lead to further loneliness, anxiety and stress, if not addressed. Social Pressures – Being in the right crowd can matter in school. Fitting into a social circle can cause a lot of stress and anxiety. Pressure to conform or act as others do can lead to poor grades, a change in personality and even pressure to do things outside of your comfort zone. Transitions – Moving from high-school to college is a new start for many. A chance to reset. Lots of students use this as a way to express their personality, others struggle with this change. Being the new fishes in the pond can scare students who got comfortable with what they knew. Tough Classes – The stress of intense topics in the classroom can put pressures on a student to perform. The complexity of the subject might not be manageable. With a demanding schedule and a fear of being left behind a student can feel like a fish out of water very fast. Homework Workload – Managing a continuous stream of work is something all students have to deal with. The pile of work for some can be a huge stressor if not handled and managed. The workload can quickly build up and act like a clogged sink with more water coming in. Lack of Organization – One of the biggest causes of stress for students is not being organized. Not having a method to manage what’s coming in and out. As more and more things come into your to-do list, being able to handle all that’s happening and what’s coming up next is vital. Lack of Sleep – A huge stressor that students don’t consider is sleeping. Sleep is a very important part of our body’s recovery cycle. As young people, sleep doesn’t seem so valuable. But during this time of growth and study, you need it more than ever. Lack of Support – Stress can occur when a student doesn’t appear to have the support promised or available to them. Being stuck on an assignment or in a class that is overwhelming, and not having the support network of teachers, friends and family and other such resources can be daunting. These are just some of the many causes of stress and how they affect students around the world as they tackle school on a daily basis. But stress is a part of our lives no matter what. Surely you need stress?! Healthy Amounts of Stress for Students? Stress is one of many things that we deal with every single day. It’s a natural phenomenon. 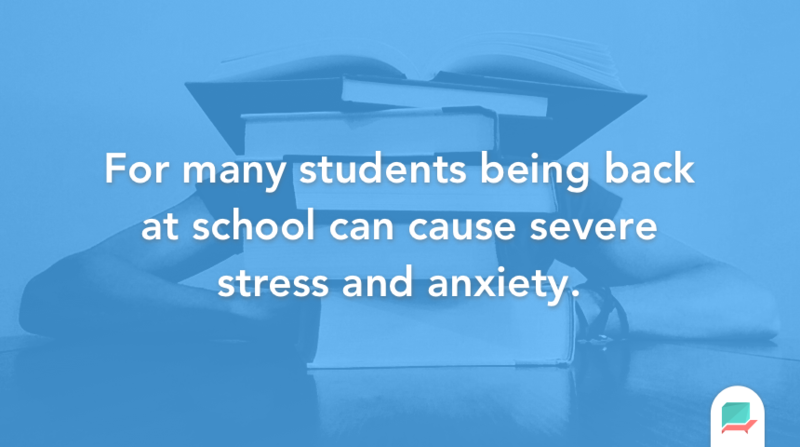 Stress and anxiety are becoming more common in students. Research from NYU shared insights into the stress levels of college students. 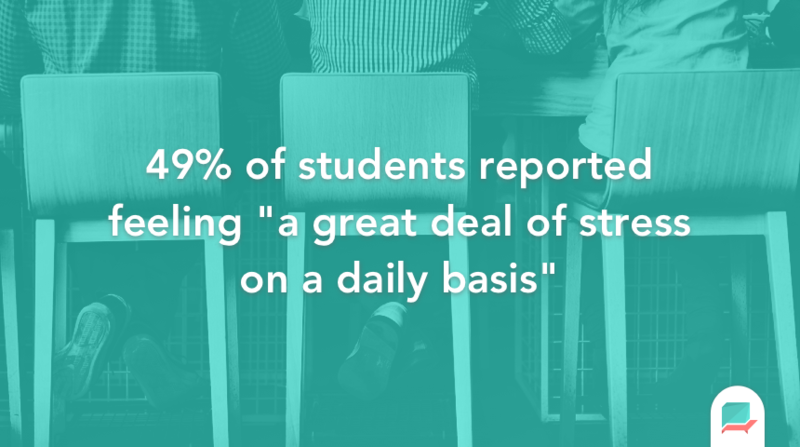 According to their study, 49% of students reported feeling “a great deal of stress on a daily basis” with only 31% of them reporting that they felt “somewhat stressed”. In this research, females reported having higher stress levels with a 60% to 41% split. The study also uncovered that 26% of the group interviewed, reported symptoms of depression at a clinically significant level. The majority of stress reported was centred around grades, homework and preparing for college. At school, high school and college, the study and workload are challenging. Many students underestimate the workload and panic to catch-up or fully comprehend what they need to do. However, is there a healthy amount of stress to handle as a student? The challenge and pressure of accomplishing deadlines are natural. The exploration and discovery that comes along with school can help us to find out more about our personalities. Stress can affect students at any time. The stress that students need to be aware of is “chronic stress”. This is a type of stress that persists past deadlines and continues with us across the day. Being able to prevent this is of utmost importance as you tackle your time as a student. Chronic stress can lead to further mental health conditions like depression and generalized anxiety. It’s time to reduce your stress levels. Let’s explore the many ways you can reduce stress and manage your anxiety during your time at school. There are four core stress management areas we’ve uncovered and would like to share with you. Let’s start by focusing on how to calm down in the moment. Stress can be overwhelming and absorb all of your attention. Pausing is your next move. Take 20-minutes out of your schedule to pause. During these 20-minutes you could meditate, sit quietly or even do some light exercise like a walking. The goal is to separate you from the stress itself and take your mind away from thinking about it. Incorporating these short breaks will help to introduce a healthy habit and routine. A popular technique during these 20-minute breaks is to write down all of your current stress on pen and paper, with the aim to clear your mind of worry. You can use the paper to tally all of your thoughts in the moment. This is a form of stress relief and will help to reset as you go into your next activity. Mediation has become increasingly popular and accessible. With smartphone applications like Calm, Headspace, Oak Mediation, Stop, Breathe, and Think and more, you can use meditation to reduce stress and anxiety by taking time to pause and clear your thoughts. Start with a simple session and work your way towards more advanced practices. The benefit is that these applications help you to take on meditation with no prior knowledge. Time management is being adopted in many schools as a way to help get yourself organized. If you aren’t lucky enough to benefit from these lessons, time management is easy to get started with. Time management can be applied to help prevent future stress by helping to plan in any incoming workload. Organizing what you have coming up and what needs to be done will save you huge amounts of worry and stress, and of course effort hunting for what you need next. Evernote, Trello or Todoist are strong applications to help keep yourself organized. Evernote is a good note-taking application, Trello is a visual way to plan your projects and assignments and finally Todoist a way to manage your deadlines. All of these applications are available on iOS and Android and are perfect for using outside of schooling too. All of these tools are praised by students of all ages. Give them a go! YouTube channels like Thomas Frank and Lavendaire can help you make sense of all of the ways to improve your study routine and keep productive. Keeping yourself organized is easy once you’ve adopted a set of resources that are suitable for you. These applications are some of the many recommendations if you don’t feel these suit your needs. Growing a friendship circle that is healthy to support your stress. Finding people that are like-minded in interests and hobbies will help you to reduce stress. Building a support network of other that you can discuss anxiety and stress with will help. Asking your teachers whether there are clubs, extra-circular activities and lunch-time meetings that you can attend can help you to bridge the gap and start meeting people. For the older students, using apps like Eventbrite to discover events in the local area can be a good way to connect with hobbies/interests. A healthy circle of friends will be open to discussing topics like anxiety and stress. Sharing their stress and workload with you to help you tackle it and grow yourself stronger for the next big challenges in life. You might come across these friends through common interests or even your own struggles but making sure you have a good family, friendship group and extended circle of teachers and community will help your chances of beating the stress. Taking control of your confidence is an important way to move forward. Self-confidence can be at an all-time low when suffering from stress. You doubt yourself and your decisions. Everything becomes critical and you never switch off. Once you’ve tackled stress and brought yourself out of the deep water, bring your attention to maintaining this. Building organization systems to help keep your head above water the next time, speaking with friends about your struggles and using calming methods like meditation to bring your anxiety are all ways to keep ahead of your stress. Remember healthy habits adopted will pay dividends as you continue to use them. Our final recommendation is to try our new application Therachat, a way for you to tackle anxiety through therapist-curated activities. It’s free and there’s a host of powerful practices for you to get involved in and learn how to fully take control of your stress. Let us know in the comments how you are handling stress in college or high school, we’d love to hear how you tackling anxiety and stress. One of our values here at Therachat is “Plethora”. This means that we are always striving to do more with less. Sometimes limitations get us. This is not one of those times. This latest release is a result of exactly that Plethora which characterizes us! Each journey comes with a set amount of evidence-based activities, created by a licensed therapist, which will help you reach your mental health goal. Those activities can be completed all at once or at a pace that feels comfortable to you! You can always go back and review what you did and reflect on it as well. Adding insights based on your journey activity. You tell us! Just email support@therachat.io and let us know (send us also your favorite panda gif)! The Journeys feature is a paid feature and you can purchase it starting from $5.99/month. You can also purchase an annual subscription at $59.99 per year (which is $4.99 per month billed annually). If you are an existing user of the mobile app then you’re up for a big surprise! We tried to give our app some love and we really really hope you like it! If you are new to Therachat, download here for iOS and here for Android! Thanks for reading and leave a comment if you have questions or feedback!